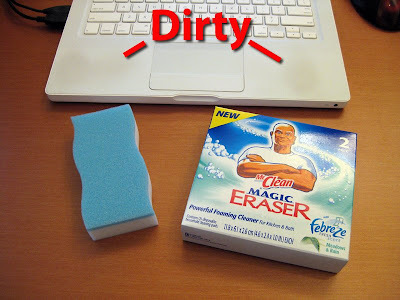 I had a number of people tell me in the comments of this blog that I should check out Mr. Clean Magic Eraser when I complained about the palm rests of my MacBook becoming dirty. Turn the MacBook off and disconnect it from power. Use warm water to soak the sponge, squeeze it a few times to get the suds to come out then wring out most of the water – this is a computer after all and you don’t want liquid to get into the keys. I applied it and very little moisture actually came off. 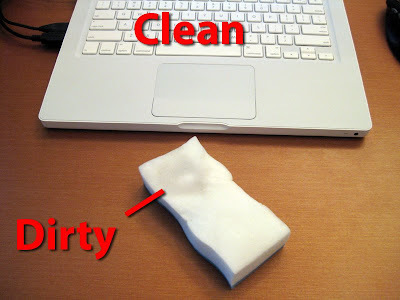 Use a clean, dry cotton towel to wipe down the MacBook afterwards – get rid of all the moisture. Be careful when wiping it over the keys. This is where the Magic of the sponge actually happens because you need very little pressure to get the keys clean. Treat it like an eraser. Ron mentioned in the comments that you should not use the sponge on the outer shell of the MacBook and I agree. It’s slightly abrasive and will likely scratch the surface. Thanks for the great tip folks! My MacBook now looks like new again!